1) Don’t Be Afraid, Don’t Be Very Afraid. Although this specimen is all legs and hooks, it measures mere millimetres across. 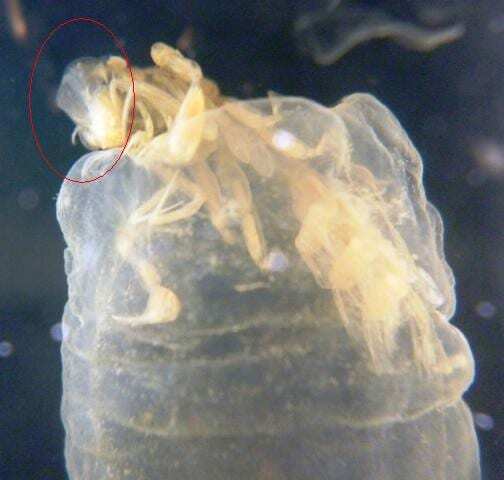 Phronima isn’t actually a xenomorph, it is a genus of amphipod crustaceans, a group of nearly 10,000 species of typically small crustaceans which can be found in the deep sea, freshwater and terrestrial environments. There are around ten species of Phronima and they are found in oceans around the world apart from polar waters. This specimen was collected in the Faroe Channel. 2) Roll in a Barrel. We have a number of Phronima specimens on display in the Grant Museum and if you look closely you can see the faint outline of a barrel shaped structure in which these specimens sit. Phronima species are parasitoids, using their claws and mouth to hollow out the barrel shaped body of tunicates called salps, gelatinous planktonic animals. They then use these barrels as a mobile nest, depositing hatched young around the inside of the nest, an example of a behaviour called demarsupiation. This rather dramatically narrated video shows this in detail. This behaviour has lead to these animals being referred to as ‘pram bugs’. 3) Game Over, Man. 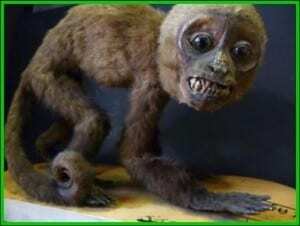 The striking resemblance of the design of the xenomorphs, particularly the Alien Queen in the Alien films, has lead many people to baselessly speculate that this creature was the inspiration. I’ve not been able to find a single source that has any evidence to support this claim although the similarity is obvious. 4) Four eyes. 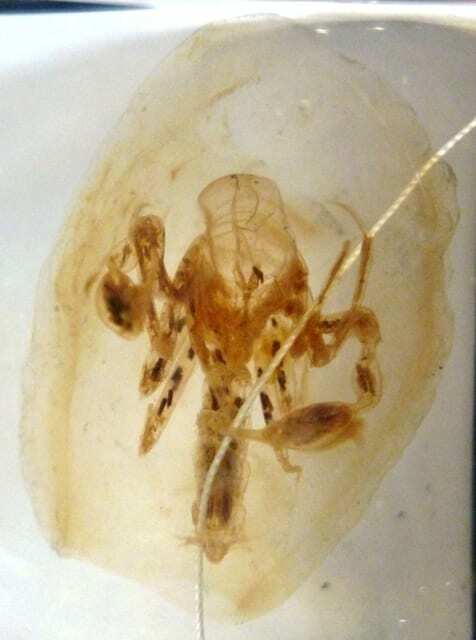 The specimen here is mysteriously missing all or part of it’s head, even under magnification it’s hard to see quite what’s going on with the transparent exoskeleton. However, another specimen in the collection (pictured below) shows the distinctive ‘crest’ above the animal’s head. This ‘crest’ is actually a second set of eyes the evolution of which allows Phronima to locate small objects in low light conditions (Land 1981). 5) House Wars. Particularly nice fresh barrels or those which have already been customised (a process which has been observed to take up to 40 hours) can be highly sought after. In a 1988 paper, Carol Diebel, describes how a female Phronima attempts to dislodge a brooding mother from her barrel by gripping on to the outside and spinning it around at full swimming speed until the original occupant is dislodged (Diebel 1988). Readers will be happy to know that in this specific recorded incident the original occupying female managed to regain possession of her house and her offspring who bore witness to this house war after several oustings and reoustings. Land, M.F. 1981. Optics of the eyes of Phronima and other deep-sea amphipods. Journal of comparative physiology. Vol. 145, No. 2. 209-226.